FoxGate S9548-GS4M2 – new generation and high performance switch of 2+ level of OSI network model, has hardware support of IPv6, certified IPv6 Phase ll. The presence of third functional (hardware support for IP routing, support of RIPv1/v2 protocol, static routes and default route) allow to work with routers and switches level L3. High-density optical ports in a single device makes the switch to one of the best decisions aggregation optical networks FTTB + LAN. 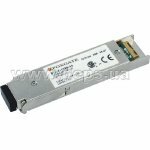 Switch FoxGate S9548-GS4M2 has 48 gigabits SFP ports, 4 of which are shred with copper ports 1000Base-T. The switch has the ability to install up to two optional modules. Each module has two 10-Gigabit ports. 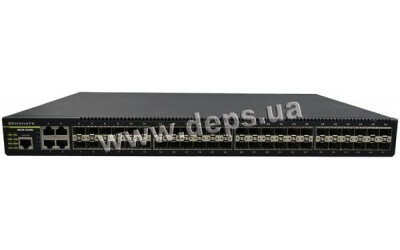 There are two types of modules: module M9000-2X (2x10G XFP) and module M9000-2S+ (module 2x10G SFP+). This flexible, scalable solution allows to install up to four 10G XFP/SFP+ as needed, thereby reducing the cost of initial investment. Switch FoxGate S9548-GS4M2 can be applied at the level of aggregation of network service providers, large enterprises and small and medium businesses (SMB), in data centre’s, and also in the access networks with high bandwidth (1Gbit/s на per user). The switch provides high performance of 2+ level, routing and support for IPv4 and IPv6. Gigabit SFP ports support a number of Gigabit Ethernet mini GBIC transceivers for optical connections of varying lengths. 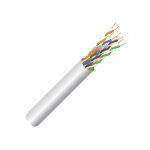 10G connections are made with modules XFP / SFP +, hot-swappable and to transfer data at up to 300 meters over multimode fiber-optic cable, and 10 to 80 km over single-mode. To build cost-effective physical stack, users can use one to four ports of 10 Gigabit Ethernet SFP + and Direct attach cable, reducing the cost of stacking of 2 or more times than the solution of multi-mode SFP + modules. Switch FoxGate S9548-GS4M2 supports multicast at level 2. Implemented support protocol IGMPv1/v2/v3, snooping. High reliability is achieved by a network protocol implementation MRPP. 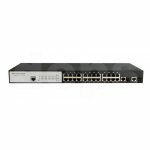 Switch FoxGate S9548-GS4M2 supports up to 8 queues per port, providing a separate service of eight types of traffic. Prioritization of traffic in accordance with IEEE802.1p, DSCP, IP-priority and port TCP / UDP, which ensures optimal service real-time applications such as voice and video. Bidirectional speed limit by port or traffic class preserves network bandwidth and allows full control of network resources. IEEE 802.1x access control and access control based on MAC-address given assurance that users will be authenticated before have access to network resources. Access to critical network resources may be limited by ACL, packet filtering is based on the packet header level 2/4. For some network resource access can be limited in time as well. Secure network management protocol is implemented using SSH, encryption of management information. Authentication with RADIUS to centrally manage access to the switch and attempt to prevent unauthorized users from changing configuration. M9000-2S+ – module 2x10G SFP+ for switch S95xx-GSx, S98xx-GSx, series. Speed packet processing, pag./s 131 mln.